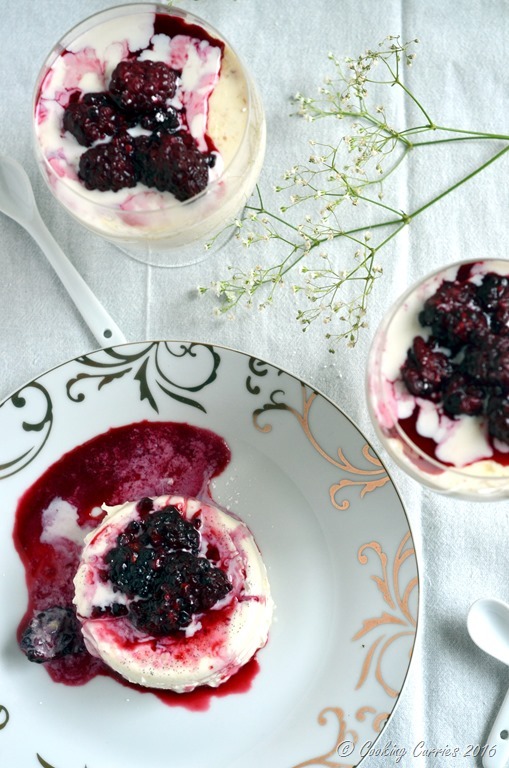 The light spiciness of the ginger and the richness of vanilla bean along with the warm blackberry honey sauce takes this panna cotta to an unusually exotic level! This panna cotta recipe has seen many trials and misfires and tragedies and is finally here now after I have tackled all the elements of it. First I over heated the gelatin and destroyed it structurally that it wouldn’t set and then I realized that one of the ingredients in this recipe, the ginger, actually inhibits the gelatins ability to set. I did not know that before. So, there are a few others that also affect the gelling abilities of gelatin– tropical fruits like papaya and pineapple (contains an enzyme that destroys gelatin)mango, guava, kiwi, strong acids and tannins such as in wine distorts the gelatin’s ability to gel as well as salt which decreases its gelling ability, ginger etc. (source: ChefSteps) So, the first time I made it I over heated the gelatin and also added ginger and did not do anything to the recipe to counter the effect of ginger. Its science, folks! So, I got smarter the next time, did my research and did what I thought would make the panna cotta set. 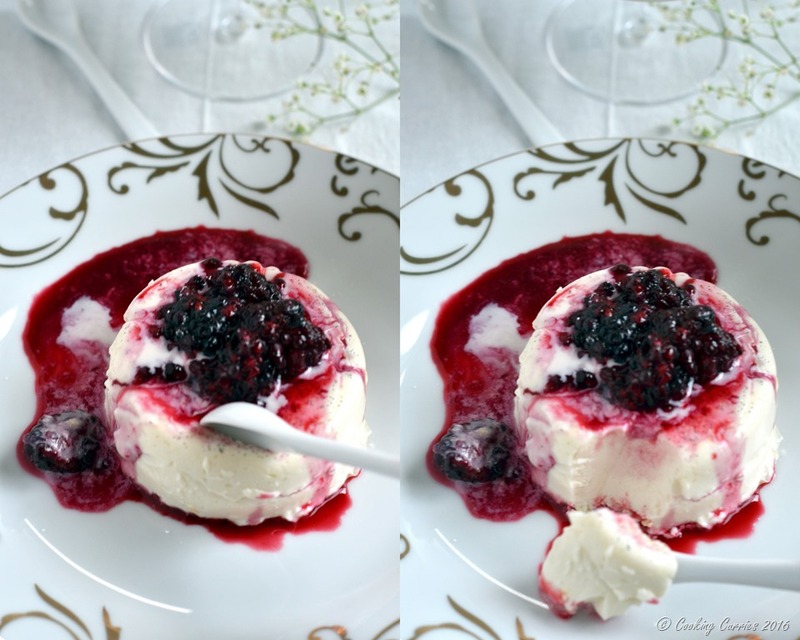 My bet paid off and here it is – Ginger Vanilla Bean Panna Cotta! Usually it takes 1 tablespoon of gelatin to set 2 cups of liquid but I used a quarter tablespoon more of gelatin for each 2 cups of liquid and hoped that the extra gelatin will not harden my panna cotta but will be enough to help offset the effect of ginger. Whether it was truly that or not, my panna cotta did set inspite of the ginger in it and boy! did it taste amazing with the ginger or what?! I also made a last minute berry compote or sauce with some black berries and honey and pour it warm over the panna cotta. The heat kinda made the top layer of it to melt a little and made a beautifully gooey mess! I just love it. It may not be the perfect looking panna cotta with the perfect edges and toppings on it but this looked way more beautiful and made me want to dig in and put some of that awesomeness into my mouth immediately! Here are a few tips that is good to know while working with gelatin, from The Kitchn. Heat the cream and milk in a sauce pan, add the sugar, melt it and add the ginger and vanilla bean paste. Lower the heat and let it be. Now mix in the gelatin to the 1.4 cup cold milk and let it bloom. It will turn into a loose pasty mixture. Check the temperature of the milk mixture and if it is around 100F, remove from heat, mix the gelatin mixture well and pour it into the milk mixture. Mix well.Pour into greased ramekins, if you plan to unmold them or into any other form of serving container. Let it cool a little and place in the refrigerator to chill for a couple of hours. To make the black berry compote, heat the blackberry, honey and lemon juice in a sauce pan while mashing some of the black berries, for about 2 minutes or so. 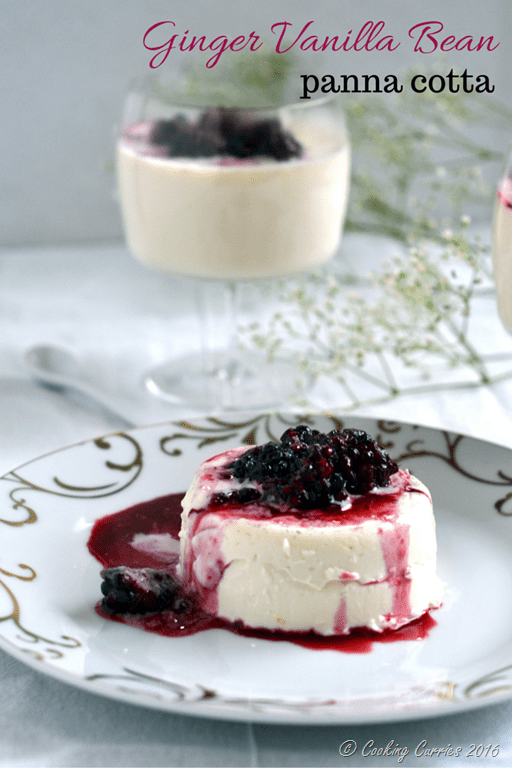 Pour it warm over the panna cotta and serve immediately. Yum! Love the ginger in this! And stunning photos! Love love the flavor combo, and I appreciate the tips! These look so fresh and delicious, thank you so much for sharing all your trials and successes with gelatin! Gorgeous photos! Thanks Isabella! It was way too much fun learning this process, that I could not keep it to myself! It look so beautiful and sounds delicious – I love anything with ginger! Beautiful dessert. Really like the use of blackberries. Oooh ginger. This looks yummy… i try to always use the same gelatin brand cause ive had some failures switching it up!! Thanks Renz. I ahvent worked much with gelatin but after hearing what everyone has to say about it, I am going to stick to this brand now! I did not know ginger would inhibit gelatin. 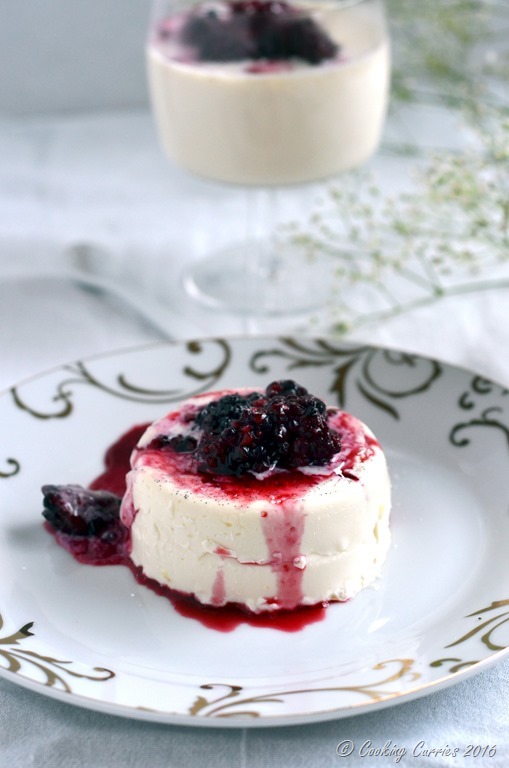 I find I am always hit and miss with gelatin but I have been yearning to make panna cotta and yours looks fabulous.